President Maithripala Sirisena has been using public funds to boost his image via social media, Colombo Telegraph reliably learns. A group of concerned citizens are already drafting a right to information request to find out, who paid these monies to Facebook to boost his image. A Response To "My (Typical) Pera Story"
We had Presidents who made multi million Dollars and no body uttered a word against such practices primarily due to the fear psychosis that surrounded their governance. WITH SUCH CITIZENS SRI LANKA NEEDS NO ENEMIES​. Traitor, Gona (whore) Friend of the Crooks, and Sevalaya ( sleeze) from those who voted for you. This Facebook ad and story peanuts compared to the millions being spent by Ranil Wickramasinghe on duty free car permits to bribe corrupt politicians and now for a new domestic Airline while the country is bankrupt and in a DEBT TRAP! Also there are already 2 defunct govt. operated AIr lines and now corrupt Ranil’s economic hit men want more funds from tax payers via the treasury to start a domestic Airline! This is a joke. The private sector should start domestic airlines and NO MORE public funds should be allocated for any Airlines in Sri Lanka which is bankrupt. CT Editors you need to do some real investigative reporting and Due Diligence on this story about Cabinet allocation for a so called domestic airline, which is a far more important story than Sira’s Facebook ad! This guy was the most unprincipled thief to ever rise to poer in Sri Lanka. It is idiots like Marakkalamarasiri, in their hatred of Sinhala power gained through MR that brought this disaster on our country. He has no backbone and he cant do anything. Marakkalamaraya will go to his Islamic hell for his part on this crime. You got it all wrong. Is your below 79? Most who voted for MaRa MaRa ChaTu MaRa fall into that category. 2, The Satanis, Iblisis, such as Wahhabies,,Salafieds, Tauhedis, ISIS, Taliban, and their clones and followers, on the day of Judgement, because they all follow, the Devil, Satan, Iblis, as per the Hadith of Najad, Prophet Mohamed, presciently predicted. Perhaps, MaRa MaRa ChaTu MaRa may to Islamic Hell as well, besides the Buddhist Hell,”Apaya”, the Hindu Hell, and the the Christian Hell as well, concurrent sentences for crimes committed. Two wrongs does NOT make it right ? I agree, Gamarala, although that means that I have to disagree with Amarasiri. 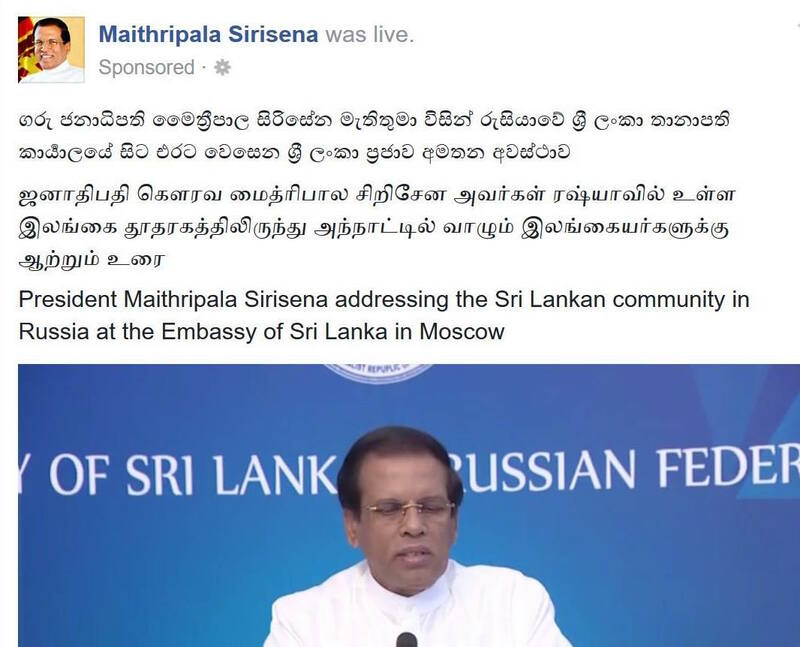 On some matters I’m as disappointed with the performance of Maithri as Amarasiri is, and I myself am pretty fed-up with all these “Facebook comments”. What I understandis that the carbon footprint from things that are displayed on computers is much less than all those “Cut Outs” of the Rajapaksas. It may be that a certain amount of money changes hands: there may be persons employed by the Presidential Secretariat just to maintain his Facebook, but does it really matter? What a great deal of plastic and paper pollution (to be swept away by Tamil – yes, we’ve got make sure that it is Tamils who are so employed – coolies), not to speak of noise pollution? Just ten comments on that, and I don’t think Weerasooria will ever open up on that subject again. I was not trying to justify use of public funds by politicians. However this matter is minute compared to whats happening in Sri Lanka even now Central Bank Bond scam, commissions from expressways etc etc. In Sinhala theres a saying ‘kenda kanda karanawa’. This is just making a mountain out of a mole hill. Yes. Some missed your point. You cannot get them all to understand. Even now, 25% of Americans, 34% of Europeans and perhaps 50% Sri Lankans believe that the Sun goes around the Earth. When Mahinda Rajapaksa and cronies did so much corruption over a 10-year period, and the new Yahapalanaya did additional errors in order to pay for those errors, such as the Bond Scam, and gave billions in tax free car permits to MPs, in addition to the Rs 2 lakhs each month to MPs, to bribe them, it’s peanuts to Sri Lankan taxpayers., compared to the billions wasted by the Rajapaksa and cronies. Sirisena came to power promising to stop waste and corruption and as such, he has no right to use Public Funds To Boost His Image. He got his right AFTER he was elected, by giving false promises. That is why he has earned new titles of Turncoat, Traitor, Gona, Mala-Perertaya and Sevalaya. Game, you cant hide the fact that your effort to ‘sudu hunu ganna’ to your favorite boss. The current president too is same as his predecessors when it comes to lavish expenses. If one is still under the impression that Maithreepala president is so so down to earth, he/she can have a glimpse of the convoy, carries this ‘humble’ head of the state! And, he has no second thoughts when he gives his consent to bring down modern SUVs’ to ‘poor’ ministers of his cabinet! So much so to his ‘humbleness’! While the Nation’s humans suffering with diseases by the effects of Pollution, Chronic Kidney Disease of unknown origin, Mosquito borne diseases , Heart Diseases , from the North to the South due to Lack of Funds the Parliamentarians are spending all the funds on their Luxury Life. The health professionals are on strike everyday by the Parliament and the Liptons square, shouting with vengeance and jealousy . Not sure whether the young and old standing around with placards are paid up coolies for the purpose!! Nobody seem to be working in the country! Talk Talk, walk the Talk. and the health professionals are pretending to be RESEARCHING the cause of the diseases are draining the funds . Our country men women and children are suffering with CKD ,Dengue of a new strain, heart disease and Diabetes among young and old is too common. The stigma within the communities of aquring these diseases too putting villagers off from seeking help. Are our country men living like in deep African jungle with lack of knowledge and Education ?? Leprosy too is making a return after having boasted by our hierarchies that it’s been iradicated. Hello !! What’s going on?? Are we living in a country who thinks IGNORANCE IS BLISS while the Clever Dicks Sponge the WHOLE WEALTH?? At least we can raise our voices now unlike during the last Regime one would be Silenced by Bullets by the powerful Siblings and the Offsprings of the Mega Maniac!!! Are our fellow country men living like Apes ? Jumping from one tree to another ? It’s a shame of a country once boasted of 92% literacy during and soon after the Colonial rule. Now our country fellows are master Thieves of the world behind Nigerians!! in the Table of world thieves . Nothing can boost this goat. He is on deflation mode and may have to resign long before he is impeached. Great Patriots, dumb when they should speak out, as during the previous regime, and very outspoken now when there is freedom of speech. No wonder we are in this mess. Gonburuwa, since when did two wrongs make a right? If you rob a state Bank is it okay for me to rob a sub post office? While you are at it can you also find out how much public money Mahinda Rajapaksa spent for his online publicity as well!? Why don’t you use the RTI (Right to Information Act) to disclose all the information about all these huge construction projects all over colombo!? Tell us who the directors are, who their majority shareholders are and where the money is coming from!? That would be much better than chasing after the Presidents Facebook promotion cost!!! Silva bro, why don’t you use that right? It is your right bro! Send a RTI request ASAP! How much do tv and radio adds cost over Facebook adds!? Why bring this up anyway!!? Sand mining is not profitable? Right to information. This is one more white elephant in SL.. this is a joke…who care about this ? Who says this ? Letters you have sent to many offices could be destoryed..files could be taken away from offices…officers could be bribed ? This is SL…so how could you say that people have this right information while officers in goverment department behave like dictators and take laws into hand ? So..if president uses his influence this is not Stange. Let him enjoy his power …this is SL not London or New York…let them do what they want to do ? operating the whole set up. If and when the Head of an institution (like a principal or OIC of a police station or VC of an university) is the information officer he or she is unlikely to disclose information on his or her own wrongdoings. Any appeal to an equally compromised Designated Officer will not help. The RTI Commission is supposed to be independent but receiving help from them and a possible court case by the Commission will take a lot of time. .What is the big deal President’s office should have allocated budget for marketing and that should take care of this peanuts? Looking at how much MR spent on his campaigns this is not even fraction of a single poster perhaps. MR even used hologram technology for the first time in SL and a private company claimed sponsorship, but why would a private company spent such huge money on him is a different question. The question is ‘Who paid’? I think we use RTI and ask for this information. I don’t think that you can have any idea how much harm is done by the sort of snide remark you have made about those whose English is not of the Standard Sri Lankan variety. Judging by your brief comment, your own English appears to be perfect, but your Parthian shot is nasty. 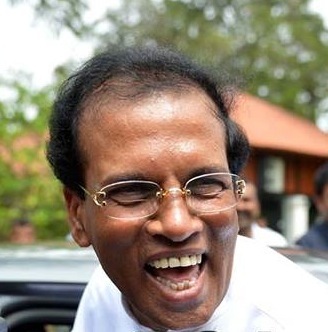 I am disappointed with certain aspects of Maithri”s recent performance. However, occupying the position that he does must be nerve racking. Let his kids have the occasional trip, provided they don’t thrust themselves in to the limelight – the way Daham used to. I don’t know how large an entourage Maithri took with him, but it seemed to be on a commercial Emirates flight. I wonder if ALL the First Class flights were taken by the entourage. (I have no idea whether there are seats more luxurious that First Class; I don’t think it healthy to be so obsessed with other people’s relatively harmless pleasures). I hope you haven’t forgotten the reasons why Emirates gave up running Sri Lankan Airways – something about off-loading regular passengers in London? To return to English: it may be a quasi-First Language for some of us, but nationally it should be no more than a language linking us to the world. Putin is NOT a nice man, but Maithri may have gone there because he knows some Russian, from his youthful year there. I consider his showing his kids that early haunt of his to be relatively harmless. For all its length, this is only a passing comment! Were these same people asking who paid for giant posters of the uneducated uncultured filth ,the free laptops,car loans,Sil cloth, roofing sheets,helicopter rides, Sri Lankan flights etc.etc.etc. To these dumbos who keep on saying ‘Mahinda did that’ ‘Mahinda did this’ I would like to say that people threw him out and brought these ‘Yahapalana’ guys because they promised that they would do things differently. But if they are doing things in the same way (many think so) the ‘Change’ we expected is going down the drain. MR will not settle for a cheap publicity. Sirisena is a useless codger. He has no brain to boost.